Testing after traffic-stop not required for Laser Ally? I returned from the Newmarket Court House with a family friend last Friday. OPP officer & sitting prosecutor told us that the officer did not need to test the Laser Ally after the traffic stop. The manual only requires them to test the device before the traffic stop. We were given a copy of his notes and a copy of the testing pages for the Laser Ally. We were given a one week adjournment to review the manual. Family friend was charged with Speeding 149 in a 100 zone at Hwy 407 & Pine Valley. This was not reduced, we were offered 129 in a 100. I believe this is a gross misinterpretation of the manual. 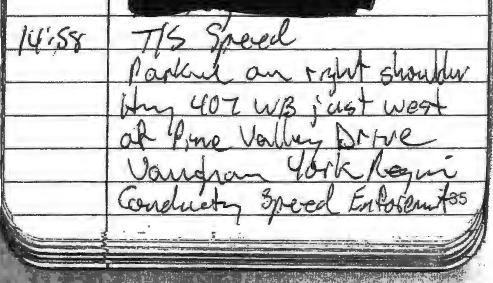 I also have a copy of YRP's Laser Atlanta manual from a different speeding charge in Newmarket and that too talks about testing the device before the shift. 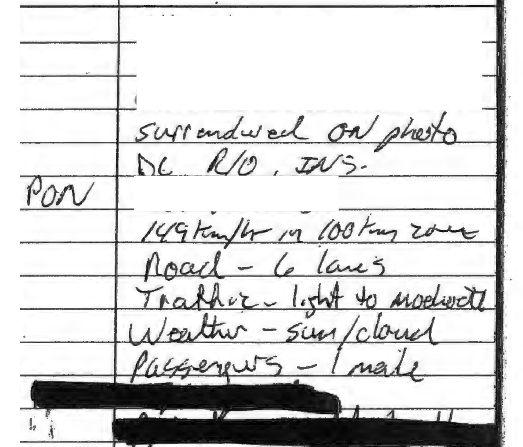 But the YRP officer testified under oath he tested the device after his shift, and also recorded this in his notes. Both Laser Atlanta & Laser Ally testing pages do not say to test the device after the shift. But the essential elements for a speeding conviction in Ontario requires that the device be tested before and after the shift. Is the prosecutor and officer incorrect here? Should we proceed to trial? Are there any laser manuals in Ontario that specifically state to test the device after the shift? Last edited by iFly55 on Tue May 26, 2015 1:37 pm, edited 1 time in total. 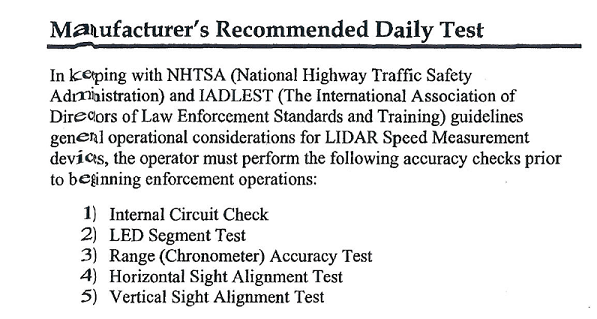 Re: Testing after traffic-stop not required for Laser Ally? The fact that the device wasn't tested at some point after the stop introduces reasonable doubt as to whether it continued to function correctly. In the R. v. Vancrey decision the Justices of the Ontario Court of Appeal referenced the D'Astous v. Baie Comeau case in Quebec. (The Quebec case I cited is in French.) They held that in order for the radar device (which the OCA subsequently applied to the laser) to be verified to be working correctly it must be tested before and after the stop. Reference paragraphs 18 and 21 of Vancrey. IMO, the manufacturer's requirement to only test before the stop means diddly. "How do you know the device was not malfunctioning?" I say go to trial and reference Vancrey and D'Astous v. Baie Comeau. If the JP doesn't agree, I think there's a good chance to win on appeal. The initial disclosure provided by the prosecutor's office did not include the testing pages nor any information about a test after the shift. So we even brought R. v. Vancrey and I was ready to advise my family friend to be prepared to accept a plea-deal if the officer provided us notes about testing the device after the shift and the prosecutor provided us the testing pages. I was shell-shocked when the officer & prosecutor told me the Laser Ally does not need to be tested after. We were offered +29 on the first appearance, but there was no plea-bargain discussion on the second appearance. The sitting JP on the second appearance gave us one week to review the disclosure, and told us that on the third appearance we should set a firm trial date. He also implied we could work out a plea-deal as well. I was pretty confident that it needed to be tested after, just wanted to make sure the manufacturer's blurb didn't have more weight then a CoA decision. You may also need to request further disclosure to include the manual version. The testing procedure I have is three pages in length. It does state that the tests be performed before shift and no mention of after the conclusion of enforcement actions. However, testing before and at the conclusion of enforcement action is standard in Ontario. So we just came back and the new sitting prosecutor also said that laser devices only need to be tested either before or after. They don't need to be tested twice. She said that R. v. Sepiashvili  O.J. No. 3996 says that the Justice of Peace can be satisfied with only one test being performed. I've read the entire decision in full, and even during Sepiashvili trial the speed enforcement officer did a test before and after the traffic stop. The focus of that Court of Appeals decision was whether the crown needed to prove the reliability of laser by comparison with radar. 37 Now that the reliability of the "LT1 Marksman 20-20 Laser Speed Detection System" has been established, evidence that a qualified operator tested the device in accordance with the manufacturer's specifications and found the device to be in working order is sufficient to establish prima facie reliability. 38 In this case there was evidence at trial that P.C. 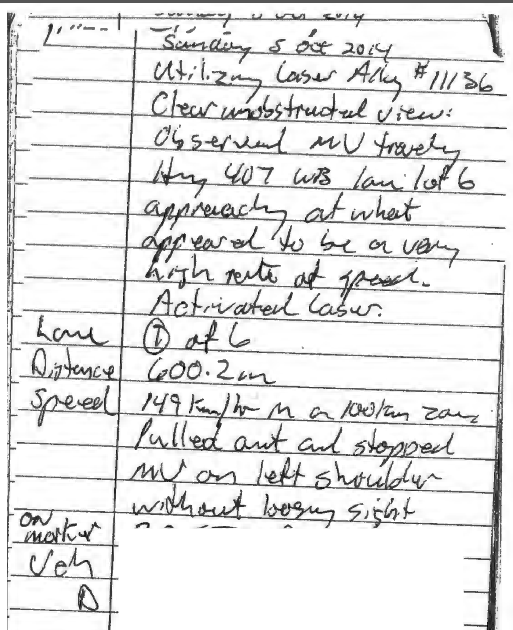 Stone was a qualified laser operator, (Trial Transcript April 30/02 at p. 4) and that she had tested the "Laser L.T.1 20-20 Marksman" on the day in question according to manufacturer's instructions and found it to be in working order. 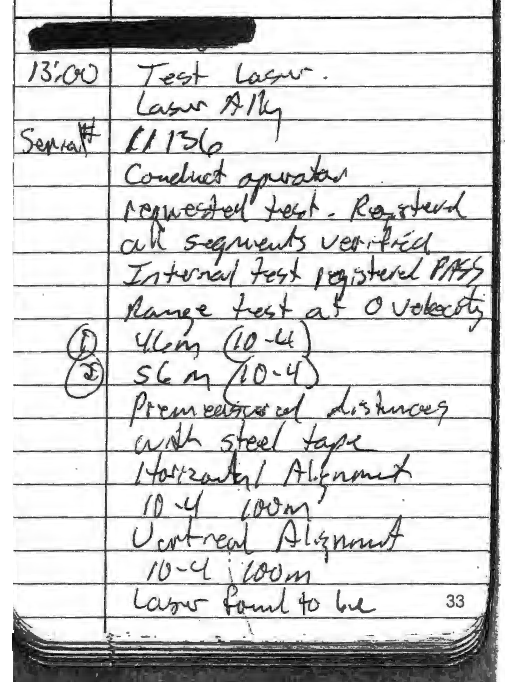 (Trial Transcript April 30/02 at p. 3) At the roadside she conducted a further "scope alignment test" according to manufacturer's instructions and found the device to be working properly. Later that day, after her dealings with the Appellant, she again tested the device using the "scope alignment test" and found it to be working properly. (Trial Transcript April 30/02 at pp. 3-4). There was no suggestion in cross-examination that the device was not functioning properly on the day in question, nor was there any suggestion that the investigating officer did not operate the device properly. The defence elected to call no evidence. 39 The learned Justice of the Peace was entitled to find that the evidence regarding the testing of the instrument and the qualification of the operator was sufficient to establish the prima facie reliability of the particular device used. In the absence of any evidence showing a defect in that device or its operation, the learned Justice of the Peace was entitled to conclude that the measurement of speed by that instrument was sufficient proof of that element of the alleged offence. Am I missing missing anything here? These three paragraphs 36, 37 & 38 discuss testing. We've set a trial date for October, our defence will focus on the requirement to test the laser device after enforcement. I asked for the full manual, and the prosecutor's office advised to setup an appointment so we can review it inside their office. I smell the Prosecutor engaging in pre-trial BS tactics. One says "only needs to be tested before," the other says "before or after." Riiiiiight. Go to trial. If that doesn't work, appeal it. The Ontario Court of Appeal spelled it out pretty clearly. iFly55 wrote: So we just came back and the new sitting prosecutor also said that laser devices only need to be tested either before or after. They don't need to be tested twice. Prosecutors and JP's always do this BS. It happened when I was representing my friend too - they convicted my friend because supposedly a test before the fact is enough to meet the threshold of 'working at the time of the offence' to the JP. You then have to order transcripts and appeal it, which you don't get refunded for... to get it overturned. Feels like this is all a cash grab for the city... but more realistically, the prosecutors are just trying to win. The city ends up losing money for all the people who go to trial + appeal, but the prosecutors only care about winning (usually if they're young). Thank you hightrafficact and all posters for the useful information that help those who want to defend themselves. This post was very useful for me because I ended up searching through canlii for speeding and the Atlanta laser device. In the convictions I saw in case law, there were tests done before and after. I went to trial recently in York Region. The officer was there. I asked the prosecutor about dropping the ticket with some excuses but that didn't work. He started lecturing me about speeding and safety, etc. So I had to bring up the issue of what about testing of the device. Not sure if this was the factor, but shortly after this conversation I was called up and the case was withdrawn due to "lack of time." New post does Security have authority to stop traffic?